This weekend, hundreds of people, ranging from Philadelphia Orchestra musicians to school kids, will play broken instruments owned by the Philadelphia public school system in hopes of getting them fixed. In a cheerful rehearsal room at Temple University, a few dozen professional musicians inspect the instruments that they'll be playing to debut an audacious piece of music by a Pulitzer Prize-winning composer. The composition is called "Symphony For a Broken Orchestra" and, fittingly, these instruments are all broken. 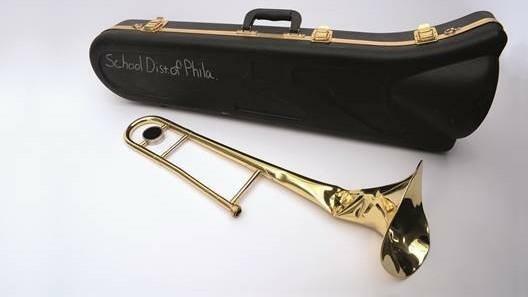 Over 1,000 damaged instruments are languishing in what are known as "instrument graveyards" in Philadelphia's public school system, which lacks the funds to fix them. This weekend, 400 of these instruments will be played in performance by musicians ranging from members of the Philadelphia Orchestra to public school children. The goal is to get those broken instruments repaired and back to kids. "Oh man, this thing is so beat up," says jazz musician Brent White, as he tries out scales on a battered trombone which is missing a slide. White has toured with the Sun Ra Arkestra and other top-tier groups, but he first learned to play music in Philadelphia's public schools. "I remember some of the broken instruments I had to play in elementary school and middle school," White says. "It's coming full circle now." The room bursts into applause as the composer of the symphony, David Lang, makes his entrance. Lang won a Pulitzer in 2008 for his composition "The Little Match Girl Passion" and he is a co-founder of the acclaimed avant-garde collective Bang on a Can. Lang was invited to compose "Symphony for a Broken Orchestra" the same day he learned of his Academy Award nomination for Best Original Song for Paolo Sorrentino's film Youth. This symphony is less glitzy, for sure, but Lang agreed to the project immediately. "I really thought of this whole thing as a kind of healing exercise," Lang says. "And from the very beginning, I made everyone here refer to these instruments as 'wounded' instruments." Cracked cellos. Vandalized violins. Flutes that gasp and leak. Horns with broken valves. 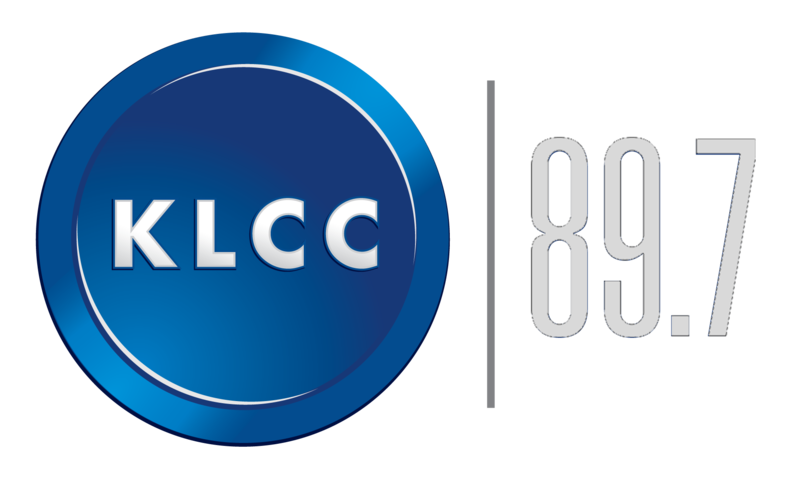 Lang worked with musicians from the group Found Sound Nation to catalog about 1,500 instruments, searching for ones that were wounded in exactly the right way. "I am trying to make the brokenness kind of the foreground," he says. "I don't want to avoid the things that are broken. I don't want to make these instruments sound like we don't notice how changed they are. And so I tried to ask for things that would highlight the fact that they are changed." Because the instruments are so difficult to play, musicians have to play in any way they can. Lang's score demands creativity from musicians whose instruments are unable to play the required notes. "It may take them several tries to find a way to get their instruments to deliver that note," Lang explains. "And all of those tries and all of those attempts that we hear through the ensemble is what makes this piece work." Non-musician Robert Blackson came up with the idea for Symphony For a Broken Orchestra. Blackson, who runs the Contemporary Museum at Temple University's Tyler School of Art, had never done a musical project before. But a few years ago, he visited a Philadelphia public school that was being used as a warehouse for discarded school materials. In one room, he had an epiphany. "It was a gymnasium that was full of broken pianos and the school district at that time didn't know what to do with them," Blackson recalls. Those pianos were likely scrapped or sold, Blackson says, but it's not too late for the wounded instruments that still belong to the Philadelphia public schools. Those who are interested can adopt a broken instrument and even hear the sounds they make on the Symphony For a Broken Orchestra website. Blackson says the project has more than doubled its original fundraising goal. Foundations have pitched in and now he's working on establishing a maintenance fund "as these instruments eventually may get broken again," he explains, "there will always be a budget to fix them." Working on this symphony reminds composer Lang of something fundamental about playing music in a group. "When you play an instrument in a public school, this is the lesson you are learning." Lang says. "I have a connection to the person next to me and our connection is based on our ability combined to build something beautiful." "And that's something we really need," Lang says after a pause, his voice filling with emotion. The day after the symphony's performance, all the instruments will be shipped off to be repaired. Next fall, children in the Philadelphia public schools will open the cases of their flutes and violins and find a note explaining how these wounded instruments were healed. Here is what a symphony of broken instruments sounds like. MCEVERS: The instruments belong to Philadelphia's public school system. It has over a thousand altogether. 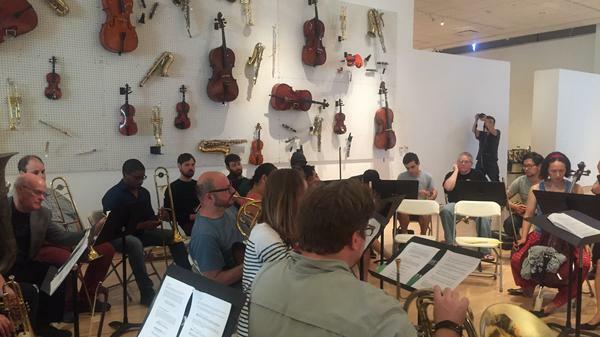 This weekend, musicians ranging from schoolkids to members of The Philadelphia Orchestra will play some of them, and the goal is to get the instruments fixed. NPR's Neda Ulaby went to a rehearsal. NEDA ULABY, BYLINE: The instruments are truly a mess. ULABY: Brent White got a busted up trombone. WHITE: Oh, man, this thing is so beat up. It looks like it's been thrown all over the place. ULABY: It doesn't even have the right slide. WHITE: This slide is to another trombone, so they took one slide from one trombone and one from the other and they put the two together. ULABY: That means this horn is a little out of tune all the time. White's a professional jazz musician. He's toured with famous bands, including the Sun Ra Arkestra, but he started off playing music in Philadelphia's public schools. WHITE: You know, I remember some of the broken instruments I had to play in elementary school and middle school, and it's coming full circle now. ULABY: When the composer enters the rehearsal room, everyone breaks into applause. DAVID LANG: Let's dive in. LANG: I really thought of this whole thing as a kind of healing exercise, and from the very beginning, I made everyone here refer to these instruments as wounded instruments. ULABY: About 1,500 wounded instruments were catalogued by Lang's assistants. Many were too wounded to play at all. Lang looked for flutes that could still gasp, cracked cellos with a few pluckable strings and horns with broken valves. LANG: I am trying to make the brokenness kind of the foreground. I don't want to avoid the things that are broken. I don't want to make these instruments sound like we don't notice how changed they are. ULABY: This piece involves a lot of call and response - makes sense when you consider it's getting played by seasoned professionals and young school kids. Only the pros are at this rehearsal. Lang tells them the kids are going to get the best instruments. LANG: It's probably only fair that you have a worse instrument than they do. ULABY: Because the music's hard, and the kids will need all the help they can get. ULABY: David Lang co-founded the acclaimed avant-garde collective Bang on a Can. He likes weird projects. This piece, he says, is like being in a freaky-sounding forest. ULABY: The musicians have to play their wounded instruments in any way they can, and the score allows for problems - like, what if your instrument cannot make the asked-for note? LANG: It may take them several tries to find a way to get their instrument to deliver that note. And all of those tries and all of those attempts that we hear through the ensemble is what makes this piece work. ULABY: Creativity, improvisation and chaos are by necessity part of the score. LANG: If you put your finger where the C is and you get a C, that's great. And if you don't get a C, that's also OK.
ULABY: "Symphony For A Broken Orchestra" was not composer David Lang's idea. The person who came up with it works at Temple University. Robert Blackson runs the contemporary museum at Temple's Tyler School of Art. He's a visual art curator. He's never done a musical project before. ROBERT BLACKSON: Not at all. ULABY: Blackson was invited a few years ago to visit a Philadelphia public school being used as a warehouse for discarded school materials. In one room, he had an epiphany. BLACKSON: It was a gymnasium that was full of broken pianos, and the school district at that time didn't know what to do with them. ULABY: The broken symphony project came too late for those poor pianos. But on its website, you can adopt wounded instruments still in the Philadelphia public schools. You can even hear them on the site. ULABY: The project's more than doubled its original fundraising goal. Foundations have pitched in, and now, says Blackson, they're working on a maintenance fund. BLACKSON: As these instruments eventually may get broken again, there will always be a budget to fix them. JAYCE OGREN: That was great. ULABY: Back in the rehearsal room, conductor Jayce Ogren is helping the musicians nail an especially tricky passage. OGREN: I was sort of thinking a little bit of a phrasing of (vocalizing). ULABY: Composer David Lang says working on this symphony has reminded him of something fundamental about playing music in a group, a belief in something very hard to find in our world right now. LANG: Which is you have to believe that you are going to accomplish something powerful regardless of the race or nationality or religion or political views of the people next to you. ULABY: And that's exactly what happens when you play music in the public schools. LANG: This is the lesson you are learning. You are learning I have a connection to the person next to me, and our connection is based on our ability combined to build something beautiful. And that's something we really need. ULABY: The day after "Symphony For A Broken Orchestra" is performed, all the instruments will be shipped off to be repaired. Next fall, children in the Philadelphia public schools will open the cases of their flutes and violins and find a note telling how these wounded instruments were healed. Neda Ulaby, NPR News. (SOUNDBITE OF PHILADELPHIA ORCHESTRA PERFORMANCE OF DAVID LANG'S "SYMPHONY FOR A BROKEN ORCHESTRA") Transcript provided by NPR, Copyright NPR.